As part of our mission to provide nonpartisan data, analysis and expertise about Michigan education, The Education Trust-Midwest will be providing regular updates on what’s happening on K-16 education through the “lame duck” legislative period. That period runs through December, until the holidays. We’ll be monitoring closely what’s at stake for Michigan students, especially students of color and low-income students. This week the legislature returns to Lansing, with several education issues possibly making the “lame duck” docket. Establish a statewide framework of support and evaluation for teachers, providing more helpful professional feedback and more accurate evaluations that are focused on student learning. Define what effective teaching means, so Michigan’s bar for “effective” and “highly effective” teaching is similar across the state. Create a voluntary model for evaluating teachers and administrators, based on research and best practices from around the nation. Many school districts and charter schools are struggling to do this work well — and in a way that actually builds teachers’ capacity to improve teaching and learning. This is key to raising student learning in our state. Our take: The new system is essential to elevating Michigan’s teaching profession; for setting clear expectations for educator performance; and for giving educators the feedback they need to excel. Dramatically overhaul the state’s current school accountability system, by changing the metrics of accountability among other changes. Accountability for school performance for low-income children and students of color could be lost. Replace the Department of Education’s color-coded school accountability system with report card-style letter grades for schools. Hold schools accountable for both the proficiency and learning growth of all students, as well as the growth of the lowest-performing students in each school, rather than simply proficiency levels. Our take: All students matter — and our state’s school accountability system needs to reflect that. Yet the current version of the “A to F” bill proposes to stop holding schools accountable for their performance for African American and Latino students. Michigan has among the nation’s most tragic and largest achievement gaps, as well as the lowest achievement for African American students in some subjects. 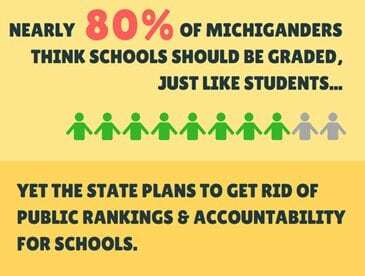 Michigan cannot afford to ignore the performance of all students in our public schools. Schools should not be able to receive high grades if they consistently perform poorly for low-income students or students of color. For a deeper analysis of this bill, please see the ETM testimony to the legislature. Require retention for students who do not achieve a “proficient” score on third grade reading exams, starting with students who reach third grade in the 2016-2017 school year. These bills call for a pilot of reading intervention programs, as well as required early diagnostic testing and interventions for students who are struggling to read early in school. The research on whether these interventions are likely to work is mixed. Do not guarantee state investment in proven strategies that have dramatically raised literacy levels in other states. Our take: We applaud state leaders for starting an overdue conversation about early literacy. 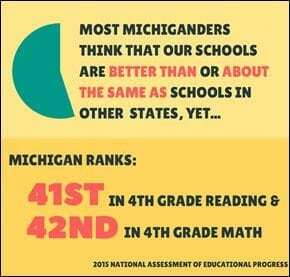 Michigan is among the nation’s worst performing states for third-grade reading improvement. Early literacy is critical to success in school and life. In order to make sure we actually succeed in dramatically raising early literacy levels, however, Michigan needs to take a comprehensive approach on this issue. That means we need a multi-prong, research-based strategy and investment. Michigan also needs to be very cautious about retaining students. Retention can stigmatize young children for failures beyond their control. Retention also carries long-term consequences, such as increased risk of dropping out. Finally, as a state, we have no idea how many children proposed retention would impact. Presently, Michigan schools are transitioning to higher college- and career-ready standards. In other states, such implementation has caused proficiency rates to fall greatly for the first two to three years of implementation. Thus, our best indicator of the number of students who would be retained under the current legislation is the performance of Michigan’s fourth graders on the national assessment. Based on that estimate, about 69 percent of our third graders, or 80,000 students — may be affected. Any policy with the potential to impact the majority of Michigan’s third grade students should be based on real data — and consider the challenges of transitioning to higher standards and assessments. “Early Warning” Legislation: Senate Bills 951–954 (Walker – R), SB 955 (Pappageorge – R) & SB 957 (Kahn – R), would permit the state Department of Treasury to provide technical assistance and require additional reporting to schools at risk of financial distress — before they post a deficit. Education Achievement Authority (EAA): HB 4369 (Lyons – R), a bill dealing with the EAA, could pop up in lame duck. Its prospect for passage is unclear due to uncertainties around the EAA, including the inter-local agreement between the authority and Eastern Michigan University.